There are probably 100’s of pitching drills listed on 1000’s of baseball related websites which describe or talk about drills for pitchers of all ages and skills. Some of these drills are excellent, some so-so, some are redundant and some I have no idea where they came from as they either didn‘t make sense or were down right harmful to the player. To try and cover even the most important topics concerning velocity, grips, spins, pressure, seams and etc. etc. would fill an encyclopedia book, and for those born in the internet age, the encyclopedia was once the ultimate source of information on any one subject. Nobody can actually say one aspect of pitching is more important than another, not without an argument anyhow, but I tend to lean towards learning control as the first component to becoming a good pitcher. I recall a movie where “Wild Thing” an imaginary professional baseball pitcher played by Charlie Sheen, had a blazing fastball, 100 mph+ but couldn’t control it. Being a comedy it showed Wild Thing knocking the team mascot out with a wild pitch or hitting an umpire standing 20’ away and to the side of the plate. But if you stop laughing and think about it, what the movie was actually showing, intentional or not, is an over powering fastball, or any other dominant pitch, is worthless if you can’t control it. The only way to ever learn control, over the plate much alone pin point accuracy, is through repetitive throwing. Practice, practice and more practice. 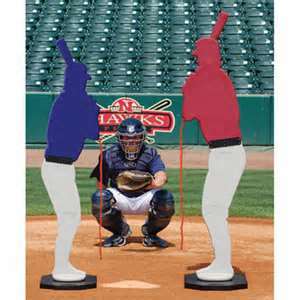 We’re going to exam a few pitching drills which will greatly improve accuracy and the amount of practice time available. What does it mean to be called a great bullpen pitcher? Well, number one it’s not good. What the phrase describes is a pitcher who can throw with good velocity and excellent control when warming up in the bullpen, but then loses control and velocity when he goes into a game situation. What could cause this complete reversal from bullpen to mound? Simple, Lack of confidence in his control. When you lack confidence in your control whether you realize it or not you’re afraid you’re going to hit the batter, or at least throw balls instead of strikes. In order to not hurt anyone, you begin to aim the ball, also known as Short Arming it, which reduces the velocity, and possibly more important, movement of the ball. Since the pitcher can throw with no hitters in the batters box, it’s obvious the presence of a batter creates the problem. Therefore, in order to correct this flaw, a batter(s) must be present in the box while the pitcher practices. 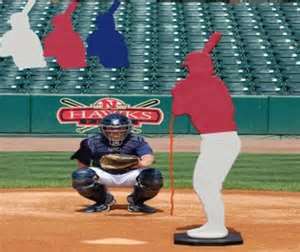 There are several methods in which to perform this drill and my favorite is to have a coach stand in the batters box while the pitcher throws. As the pitcher becomes more comfortable and accurate, the coach moves in and crowds the plate. Another coach will then position himself opposite the first coach on the other side of the plate. Then entire purpose is to squeeze the plate with 2 live batters and force the pitcher to throw down the middle of the plate. The coach assisted drill can be very effective, but in reality how many times can this actually be performed? Unfortunately, as time is quite limited, very seldom would be the answer. This is where the use of props, whether store bought or home made, becomes invaluable. Position these props as if they were batters, using them in exactly the same manner as the accuracy drill above is performed, only substituting props for coaches. There’s nothing much more frustrating to a young pitcher, eager to throw and learn, than not have anyone available to catch him. This is when we create a training partner. 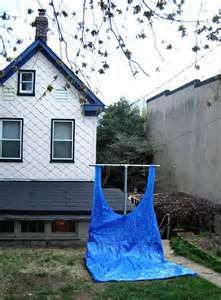 There are store bought tarps designed specifically for pitchers to practice throwing against. 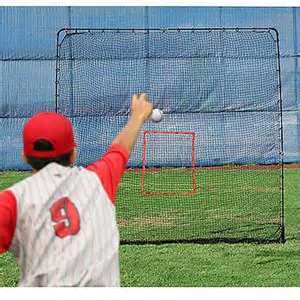 They come with designated targets and hanging components for easy set-up and are a real asset to a pitcher’s training routine. Relatively speaking they are not extremely expensive, but $2.00 is a lot of money if you don’t have it. 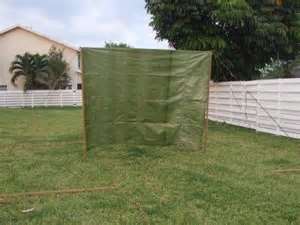 We don’t have to have a store bought pitching tarp as we can substitute any plastic or canvas tarp to serve the same purpose. (5.) Be sure not to pull the tarp too taunt. You want a little give in it in order to reduce the velocity of the baseball hitting it and tearing it down. You have created a training partner available day or night for training purposes.